CBO: Graham-Cassidy Bill Would Reduce Deficit, Increase Number Of Uninsured : Shots - Health News The Congressional Budget Office says it won't have time to analyze all the impacts of the latest GOP effort to repeal the ACA, but it says millions more would be uninsured than under current law. 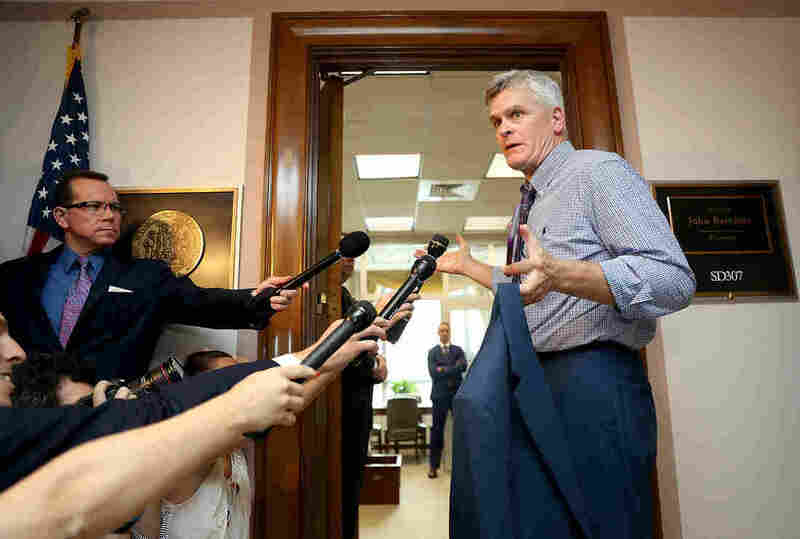 Sen. Bill Cassidy, R-La., continues to tweak the health care bill he cosponsors in an effort to persuade reluctant senators to back it. The proposal the Senate is considering that would repeal and replace the Affordable Care Act would result in millions losing health insurance and a $133 billion reduction in the deficit by 2026, according to the Congressional Budget Office's report on the Graham-Cassidy legislation. The CBO did not have enough time to estimate specifically how many people's insurance would be affected as it has done when it scored previous repeal bills. But the analysis it released Monday evening says "the number of people with comprehensive health insurance that covers high-cost medical events would be reduced by millions" compared with current law. The bill, known as Graham-Cassidy, would dismantle the major components of the Affordable Care Act, or Obamacare. Gone would be the subsidies that help people buy insurance, the mandate that requires people to be covered and the expansion of Medicaid. All the money from those programs would be rolled up and redistributed to states in the form of block grants. Each state would then decide how to spend those funds. Because of that, says the CBO, the number of people without health insurance "could vary widely depending on how states implemented the legislation." The bill also changes Medicaid by capping the federal contribution — giving states a fixed amount per person and increasing it at a rate that is slower than health care inflation. CBO says it can't do a complete analysis of the plan in the short window requested by lawmakers. Senate Republicans are looking to vote on the bill this week, before a deadline at the end of September would require they get support from Democrats to be able to pass the legislation. Earlier attempts to overhaul the health care system failed in part because the CBO analyses showed the proposed changes would very likely cause tens of millions of people to lose their insurance coverage. The major drivers of those losses, according to the CBO, were the loss of the individual mandate that requires people to buy insurance and the rollback of the expansion of Medicaid that was allowed under Obamacare. The latest proposal includes both provisions as well as even further cuts to state funding and Medicaid, so some analysts say the results will be the same. "With less money, fewer people will be covered. That's just math," says Nicholas Bagley, a law professor at the University of Michigan who specializes in health law. "And since Graham-Cassidy is a lot less money, a lot fewer people will get covered." An analysis by the Brookings Institution estimates that about 21 million people would lose coverage under Graham-Cassidy compared with the current law through 2026, and eventually 32 million people would lose it because of the block grant funding changes. A separate report by the health care consulting firm Avalere Health estimates that states would lose about $700 billion in federal health care funding over 10 years and $3.5 trillion over 20 years. The bill's sponsors, Sens. Lindsey Graham, R-S.C., and Bill Cassidy, R-La., introduced a revised bill on Monday. "Whatever the CBO score is will be superseded by another score later this week," Cassidy said Sunday on ABC's This Week.